Published: Jan. 20, 2016 at 03:49 p.m. Updated: Jan. 20, 2016 at 05:55 p.m. The 2015 rookie class might not have featured an overwhelming talent surge at any one position, à la the collection of rookie receivers who dominated 2014, but plenty of standout players entered the NFL this season. When compiling my 2015 All-Rookie Team, for example, I did have to make tough calls at running back, with David Johnson of the Cardinals squeezed out by an undrafted free agent, and cornerback, with Kevin Johnson of the Texans and Byron Jones of the Cowboys not making the cut despite strong debuts. Notably, this year's group included four undrafted players, while just one -- kicker Chandler Catanzaro -- landed on last year's squad. Winston threw for 4,042 yards, had 22 touchdowns against 15 picks and recorded a passer rating of 84.2. He started off slowly, tossing seven picks in his first four games, but improved as the season wore on, putting up a touchdown-to-interception ratio of 16:8 over his last 12 games. 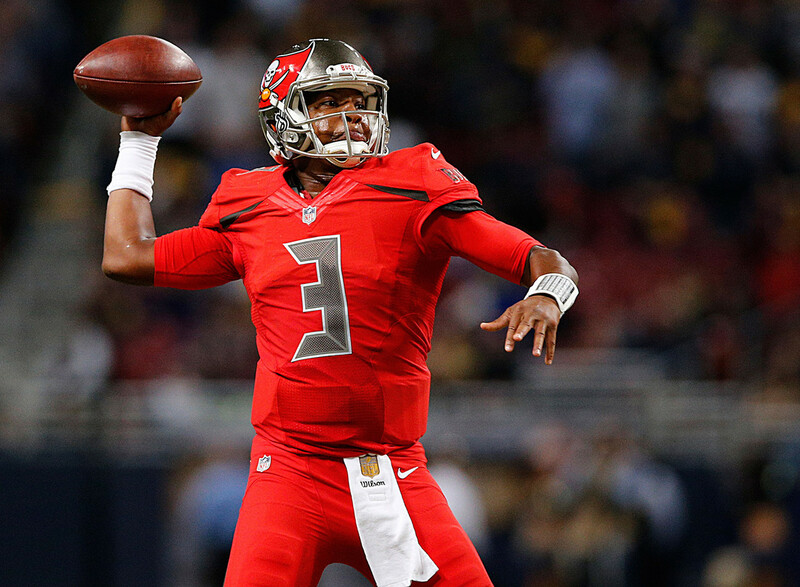 It looks like Tampa Bay has found its franchise quarterback. Draft position: Round 1, No. 10 overall. Gurley racked up 1,106 rushing yards and 10 touchdowns in just 13 games (12 starts) -- with roughly half of that yardage coming in his first four starts. He's a strong inside runner with the speed to get outside, and he's the perfect match for the Rams, who want to run the ball with power. Like Gurley, Rawls made a significant mark in limited action, putting up 830 rushing yards and four ground scores in just 13 games (seven starts) before a broken ankle suffered in Week 14 sent him to injured reserve. He's a strong insider runner and better than expected as a receiver. The Seattle future of the man Rawls replaced several times in 2015 -- Marshawn Lynch -- is in doubt, but it looks like the run-loving Seahawks have a long-term answer in Rawls. Cooper tailed off toward the end of the season, recording just 10 catches over his final four games, a stretch that included a shutout in Week 14 in Denver. But that shouldn't take away from a 1,070-yard debut campaign in which Cooper showed the ability to get open and make sensational catches. He'll have to concentrate a bit better to eliminate some of his drops, but his long-term potential is that of a perennial Pro Bowler. Draft position: Round 5, No. 146 overall. Diggs wasn't even active for the Vikings' first three games, and his production fluctuated, including in his final six games of the regular season, when he totaled just 147 receiving yards and two scores. But he's very athletic and quick, and it looks like he's going to be one of those slot receivers who is extremely tough to cover, a solid starter in the NFL with above-average speed. Tye led a relatively weak tight end class with 464 receiving yards on 42 catches. He's a tough matchup because he has a stocky build -- checking in at 6-foot-2 1/8 and 262 pounds -- with 4.55 speed. It almost looks like he's a lineman, then all of a sudden, he's downfield, with his speed and explosion. Tye also did a pretty good job as a blocker. I think he helped open things up for the receivers and contributed to Eli Manning's strong season. Smith started all 16 games, contributing to a significantly improved offense in Tampa Bay. I don't think the athletic, long-armed tackle will ever be a Pro Bowler, but he should be a solid starter for some time to come. The pectoral injury Will Beatty suffered last May necessitated that Flowers jump right into the mix at left tackle, and he acquitted himself well as a back-side pass protector, with Eli Manning being sacked just 27 times. Flowers is still just 21 years old and needs to get stronger; if he does, he'll be a perennial Pro Bowler. Scherff had a hard time in the beginning of the season, with opponents bull-rushing him and throwing everything at him, but he improved tremendously, playing extremely well in the second half. He protected the passer and was a good run blocker. As a guard, he has Pro Bowl potential. Draft position: Round 1, No. 28 overall. Tomlinson, who played in all 16 games and started 14, doesn't look flashy, but he's steady and effective; his man rarely makes a play. He'll be a reliable presence for a number of years. Morse, who started 15 regular-season games, missed both of the Chiefs' playoff outings with a concussion, and his absence was felt. He's a bit tall (6-5) for a center, but he's an outstanding athlete who does an excellent job in pass protection and run blocking. Williams made 15 starts, finishing with 63 tackles and three sacks. This guy is fast and athletic, and he's willing to chase a play; think of how he'll go 10 or 12 yards downfield to make a tackle on a play that went away from him on the other side. Williams projects as a perennial Pro Bowler. Draft position: Round 2, No. 35 overall. Edwards shed some pounds after leaving Florida State and really elevated his performance as a pro, to the point that he was playing as well as any rookie in the NFL before a Week 15 neck injury sent him to injured reserve. Consider his effort against the Vikings in Week 10: 11 tackles, a sack and a forced fumble. Provided he comes back healthy, Edwards should continue playing at that level, and he has a chance to be a Pro Bowler. You talk about overcoming adversity; Gunter didn't play football until his senior year of high school because he was working 32 hours a week to help his family make ends meet. The first player drafted in 2015 who did not get invited to the NFL Scouting Combine, Gunter played in all 16 regular-season games, making 11 starts. He's really made an impact on that Cardinals line. He didn't lift all that well at his pro day, but he's really strong. Draft position: Round 2, No. 38 overall. Smith is not a starter (16 games, two starts), but he contributed eight sacks this season, second-most on the team, behind only Ryan Kerrigan (9.5). He has a unique ability to rush from the outside and bring the quarterback down -- a knack for shedding blockers and rushing the passer. Draft position: Round 1, No. 22 overall. All four of Dupree's sacks came in the first half of the season, with his first two coming in Weeks 1 and 2. While the sack production leveled off, Dupree showed he's a big, athletic guy whose speed and quickness make him hard to block. Anthony, the Saints' leading tackler (112 total tackles), started all 16 games and contributed a sack, a pick, five passes defensed and two forced fumbles. He played very well on a defense that was not very good. The thing about him is, he can play all three downs; you're not going to have to take him out on passing downs. Draft position: Round 2, No. 45 overall. Kendricks started 11 games and played in 14, racking up a team-high 92 tackles while chipping in four sacks. He got better as the year went on, contributing eight tackles and two passes defensed in Minnesota's wild-card loss to the Seahawks. He's short (6-foot) but very, very strong and has great recognition skills. Peters started 16 games while recording 60 tackles, 26 passes defensed and eight interceptions, tied for most in the league. He's always around the ball, has great ball skills, will tackle and has speed. Peters has a good chance to be the Defensive Rookie of the Year. Draft position: Round 2, No. 50 overall. Darby started all 15 games he appeared in, recording 68 tackles and 21 passes defensed. He didn't pick off many balls, finishing with just two interceptions, but the bottom line is, the man he's covering hardly ever makes a catch or a play. Darby is very, very good. Draft position: Round 2, No. 33 overall. Collins is strong and competitive, and he doesn't miss many tackles; when he hits you, you go down, as evidenced by his team-high 112 tackles. But he was beaten quite a bit in press coverage, with opponents successfully isolating and exploiting his coverage weaknesses. It doesn't look like he's fast or quick enough for the safety position, and I could see him eventually switching to linebacker. Draft position: Round 5, No. 142 overall. I don't know if Amos does anything outstanding, but he's pretty good at coverage and can tackle, and he started all 16 games. It doesn't look like he has the speed, tenacity or toughness you want in a safety, and I'm not sure if he'll ever be more than a decent starter. The former pro soccer draftee made 26 of 32 field-goal attempts, including four of five from 50-plus yards. He boasts a very strong leg and good accuracy. Darr's punts averaged 47.6 yards, and he had 30 punts downed inside the 20, eighth-best in the NFL. But his punts were returned with great success, to the tune of 526 return yards (third-most in the NFL) on 50 returns. It's hard to tell if that's on the punter or on the special teams unit, but it's not a good sign. Lockett earned All-Pro honors as a rookie kick returner, compiling 852 yards and one touchdown on 33 kick returns and 379 yards and one touchdown on 40 punt returns. If you want to understand his value, consider how his 50-yard kick return to open the second half of last weekend's playoff loss to the Panthers helped spark Seattle's late comeback attempt.